Transfer Images onto Polymer Clay, Silk and Satin with our Silk Transfer Paper. For use with laser printers. Print image onto Lazertran Silk in reverse or mirror on the shiny side. 1. Iron silk flat. Habutai Silk works really well. 2. Lay silk over your image and iron until the silk is stuck to the image. Use a hot iron. 3. Place the silk in clean water, paper side down and leave until the paper falls off. 4. Lift the silk carefully from the water and lay face down onto a cloth. Allow the iron to cool and iron gently from the back to dry the silk. 5. When dry return the iron to hot, turn the silk over and place a sheet of baking paper/parchment, (not waxed or old fashioned greaseproof), over the image. 6. Iron through the paper then allow to cool. Then peel off. This method produces a beautiful result for surface pattern. The silk can be rinsed in warm water but will not take a vigorous wash. USING LAZERTRAN SILK Transfer paper TO TRANSFER AN IMAGE TO POLYMER CLAY. 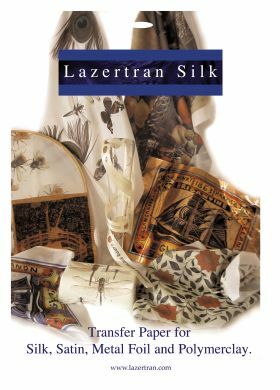 1.Copy your image in reverse onto a sheet of lazertran Silk. 2.Put the image face on the clay and burnish to make sure of good contact and leave for 30 minutes. 3. Drop the clay with the image attached into a bath of water and leave for 2 minutes. Then swish the water with your hand until the backing paper floats off. 4. Remove the clay from the water and allow to dry for 1 hour. 5. Then shape and bake as per manufacturers instructions. LAZERTRAN SILK Transfer Paper AS AN ETCH RESIST. This is a simple way to transfer toners to a plate to act as an acid resist although fine tones may be lost. 1. Copy your image in black and negative, setting the toner density to high, onto a sheet of Lazertran Silk paper. 3 Cut the image to the size of the plate. 4 Put the plate onto a hot plate about 180°C then place the image face down onto the plate and rub flat with a tissue until the image is well stuck to the plate. Immediately immerse the plate in a bath of boiling hot water and wait until the backing sheet floats off. 5. Allow to dry and when dry place the plate back onto the hot plate or in a domestic oven to make sure all the toners are properly adhered. You are now ready to etch. An aqua tint may be applied. Before printing remove toners with solvents, or heat until melted and wipe off with rag and white spirits. LAZERTRAN SILK Transfer paper WITH PHOTO SPRAY MOUNT FOR HEAVIER CLOTH, VOILE, OPEN WEAVE SILKS AND CLOTH. Lazertran Silk can be applied to all kinds of surfaces using 3M Permanent Photo Mount Spray. Have your image printed in reverse or mirror. Cut image to size. Apply spray mount onto the image then stick down onto surface. You can iron through the backing sheet if applying to cloth to make sure of good adhesion. Wet backing sheet and peel off. Leave to dry overnight.